During our last full week of school (last week) I got out the magnets for us to explore. The first day, I gave the children a pile of things on their table to explore with. That’s all we did! We just experimented with how things stuck to the magnets and what things around our classroom were magnetic. The kids LOVED it! I can tell when they are into something because it either gets really loud due to all the conversation going on or it gets really quiet due to their intense concentration. During this time it was REALLY loud! 🙂 The kids were shouting out all the things they were finding that were magnetic and letting each other know what wasn’t magnetic. We experimented until someone asked the “magic question” I’d been hoping for! “Mrs. Poindexter, why doesn’t my magnet stick to this metal thing?” Aha! Inquiry at it’s finest! 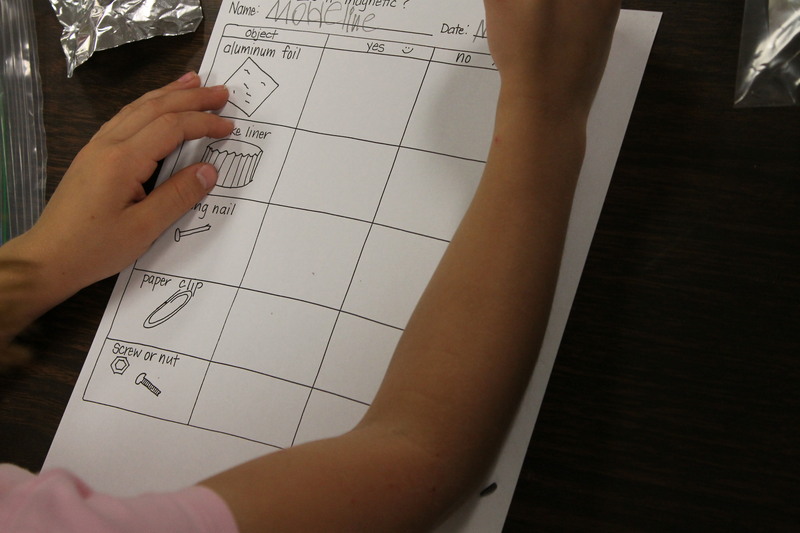 That moved us on to finding out what metal objects will “stick” to a magnet and which ones won’t. Wednesday, we got out the objects and tried out our magnet wands to test our predictions. We drew either a happy face or a sad face next to indicate whether or not it was magnetic or not. Posted on May 27, 2012, in Cheap Science, magnets. Bookmark the permalink. 1 Comment. You are an awesome teacher! Thank you do much for always sharing your ideas.